Incorporated in 1713, Weston is one of the oldest towns in America. Since then by any measurement, it has become one of the wealthiest. Massachusetts as a whole is a rich state ranking third in per capita income at $25,952. But Weston with a per capita income of $79,640 dwarfs that and most places in the United States. 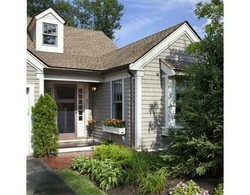 Located only 15 miles west of Boston, it is one of the city's most established suburbs. It has always been home to the Massachusetts elite and you'll see beautiful homes dating back to the 19th and early 20th Century. Many designed by famous architects such as Charles Follen McKim and H.H. Richardson. The love for architecture combined with the respect for the environment has created a unique and low-density community. You can still tramp through the wilds of Weston along the 100 miles of trails and bike paths and enjoy 2,000 acres of public open space. Weston is one of the best places to retire, if your looking for the charm a traditional New England village with understated elegance. There are several assisted living facilities and a luxury over-55 retirement community that call the town home. Weston is conveniently located. The Massachusetts Turnpike runs through the southern portion. The town is just to the west of Route 128, the beltway surrounding Boston. Look at the map above and you'll see a large open space area named the "Doublet Hill Conservation Area." Then check out the YouTube Video to the right. It's amazing to me that this gorgeous wild landscape is only 15 miles west of Boston sitting near Route 28 and the Massachusetts Turnpike, two of the busiest roads in the country. Take a look at those views of Boston. You can clearly see major Boston landmarks such as the Prudential Building, John Hancock Tower, Bunker Hill Monument, and the Tobin Bridge. On the other hand you have a tranquil spot to watch migratory birds such as the hawk you see in the video. The Weston Forest and Trail Association plays an important role in acquiring conservation lands and maintaining its own open space and the Town's as well. If you have always wanted to be involved with land and open space preservation, this would be a wonderful volunteer effort when you're retired. Often these activities will lead to an appointment to the Town's Conservation Committee or other Board. New England towns with their Town Meetings have an activist form of government. If you're new to New England be sure to check it out. Of course if you love birding, you could just enjoy the hundreds of acres of open space available for many active and passive forms of recreation. Find Your Passion for the next Third of Your LIfe. Okay, so maybe you're not ready for bird watching or even full-time retirement - a lot of Baby Boomers aren't. That's one of the reasons that college towns are popular places to locate retirement communities in . If you'd like the option to a pursue another career or just attend weekend lectures and concerts on an informal basis, you'll love the opportunities at Regis College in Weston. Travel across Route 128 and you'll find Brandeis University. A fantastic place to hear world-renown speakers in their lecture series. But you've raised your family and now you're ready for a different part of your life and are searching for a community that supports it. Highland Meadow in Weston is designed for active seniors who are ready to pursue that new chapter in their lives. It is anything but a retirement or nursing home. Set on 44 acres of rolling hills the Highland Meadow open space connects to the Weston public trails. You can certainly continue your active and engaged lifestyle. This is indeed one of the most beautiful and luxurious retirement communities in Massachusetts. Homes start at over one million dollars in this exclusive over-55 retirement community. A two bedroom, two full bathrooms condo/ town home is listed a $1,095,000. A two bedroom, two full bathrooms, one partial bathroom condo/town home is $1,395,000. A three bedroom, two full bathrooms, one partial bathroom condo/town home is $1,595,000. Lots of good retirement information -thank you!